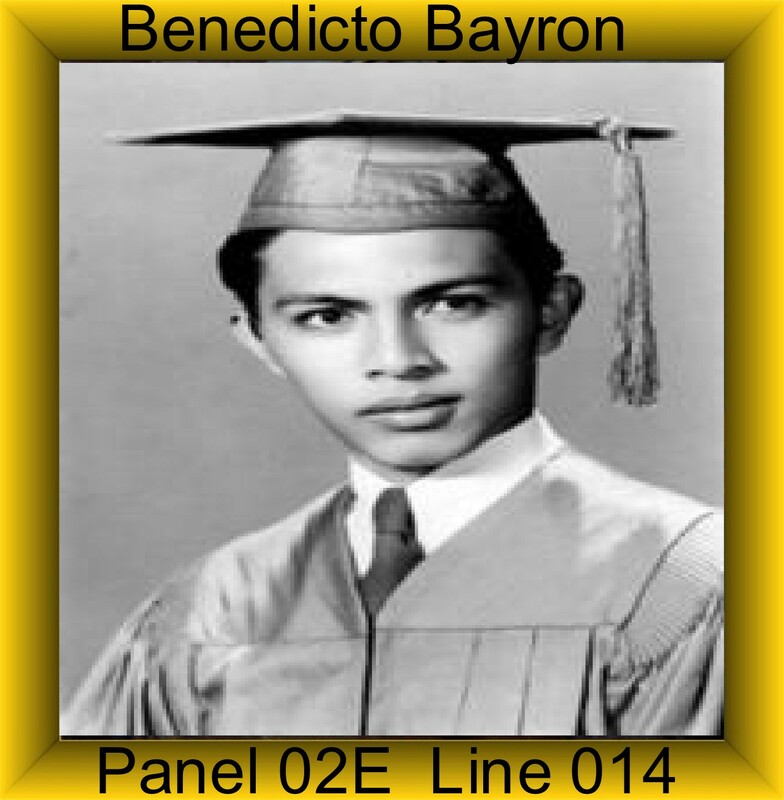 Benedicto was assigned to Charlie Troop on August 16, 1965 and was Killed in Action on November 16, 1965. Benedicto was a Pilot a Pilot of an UH-1B Helicopter. Benedicto was awarded the Purple Heart, Air Medal, National Defense Service Medal, Vietnam Campaign Medal and the Vietnam Service Medal. Benedicto Piosalan Bayron was survived by his wife (Eva Juliette Akee Bayron) and three sons (Rodney 1/62, Michael 10/63 and Darin 8/65). Eva then married Augustine (Gus) Peter Bayron, who is the brother of Benedicto and also served as an Army Paratrooper. Eva and Gus have one daughter, my sister Terre. Eva Bayron passed away in 1984. I didn’t know Benedicto well as he was killed when I was 3. I don’t think he ever saw my youngest brother who was born in ’65. I seem to remember the funeral and I believe we still have his Purple Heart and the flag that was given to us. Michael is the only one of the sons to serve; Air Force. I think we do have some pictures of “Daddy Ben” including some from Boot Camp but an unsure. We are trying to gather some information about our lineage but it is scarce. I’d like to hear from anyone who may have served with him. I have no pictures, I am inquiring about my uncle. My dad Martin P.Bayron died and did not leave much information about him. Jeremy, I did not serve with your uncle. I will check with others who did serve at the same time to see if I can get some information for you. Jeremy, I contacted a man who served with and knew your uncle. He would like to talk to you. His phone number is: Earl Reese 828-648-6004. If for some reason you can not call him forward me your phone number to pcbnamin@earthlink.net and I’ll have him call you. I can also have him email you if you send me your email. There are several men in my unit that served with your dad who would love to talk to you. I will give one of them (Earl Reece) your email address. Thanks for the comments. Is there anyone who knew your dad that can write a story telling all who read this blog what a great human being he was? Even a funny story. A picture of him in uniform would be great but also a picture of him and any of his fmaily would be great. Once, again, Thank You for the comment. Hi Rodney, I’m Mary Ellen Sniffen (Sole). I’m your cousin. My e-mail is rsole68750@aol.com. I want 2 write an e-mail 2 u. Can u e-mail me, so I may b able 2 write 2 u? Hoping 2 hear from u soon. Mary, My name is Pat. This is my blogsite. You can contact Rodney by going to http://www.rodsvoice.com or by emailing rbayron@gmail.com. I have asked him for a picture of his dad that I could Post on this site, Would you happen to have on e? If not maybe when you contact him you could ask him about this. Hi Rodney, This is Mary Ellen. Were u able 2 receive my e-mail, & if so, did u have a chance 2 read it? Can u reply through my e-mail? rsole68750@aol.com. I wanted 2 also ask if u have ur siblings e-mail, Michael, Darin, & sister, Terre. If so, may I have them? I remembered many, many, many years ago, I went with my mom (Olga Sniffen), all the way 2 Waianae (as we lived in Kailua), 2 attend your dad’s funeral service. I remembered r U.S. flag was respectfully draped over his coffin. There were many people I didn’t know nor remembered. It was a very sad time 4 every1, esp. 4 your mother. I think some of r California cousins were there, but, I can’t say 4 certain. I don’t know if my brother, Lloyd was there. I didn’t know how old u were when u dad was killed in Vietnam. But, now, I know you were 3 yrs. old. I do hope people who knew your dad, have pictures of him, etc. would get in contact with u. 2 know something about your lineage (as others should also know about theirs), is important. 2 let others know what u r doing through this way is good. thank u, Pat 4 Rodney’s e-mail. sent an e-mail 2 him. Pat – Unfortunately my brother Rodney Bayron is now passed away. Please forward any information/requests to me – Michael Bayron (bayron.family.2014@gmail.com). I do believe I can find a picture of Benedicto in uniform. I have the only surviving pictures from our mother. I will see what I can find. Please send me an email address to send the picture. MaryEllen – Please write me at the above address.